The farmer’s market has been overflowing lately. Eggplant has yet to be in season in New Jersey, but since it’s a favorite of my husband’s I decided to use this hearty vegetable to make an easy weeknight favorite that looks like you spent hours over the stove. It’s also one of those dishes that seems unhealthy, but is loaded with vitamins and antioxidants. At last week’s farmer’s market, I was able to pick up an amazing bunch of organic basil (which I continue to find uses for), a lush ‘Ugly Jersey’ tomato, fresh red onions, and homemade mozzarella. I’m a huge fan of bruschetta and tend to have it in my fridge as another salsa during the summer. It brightens up everything from a sandwich to eggs and works equally well at livening up the baked eggplant to transform it into a light and delicious summer meal. You can serve as is or with a simple salad. Tip: If you are planning ahead, try to soak the sliced eggplant in water with salt overnight in the fridge. My Italian friend wouldn’t have it any other way. Set the oven to 425 degrees. Combine the breadcrumbs, panko, red pepper flakes, Herbs de’ Provence, salt and pepper in a bowl. Dip the sliced eggplant into the egg mixture than the breadcrumb mixture and place on a nonstick baking sheet (I like to use silicone baking sheets, but you can also use parchment). Drizzle the eggplant slices with olive oil. Place in the oven for 11 minutes until crispy, then flip and bake for another 5-7 minutes. Be sure that the slices don’t burn. In another bowl, coursely chop the tomato, basil, and red onion. Grate the garlic into the bowl. Add the balsamic vinegar, 1/2 cup olive oil (good quality), salt and pepper. Mix well and set aside. Once out of the oven, let cool. Slice the tomato into thin pieces. 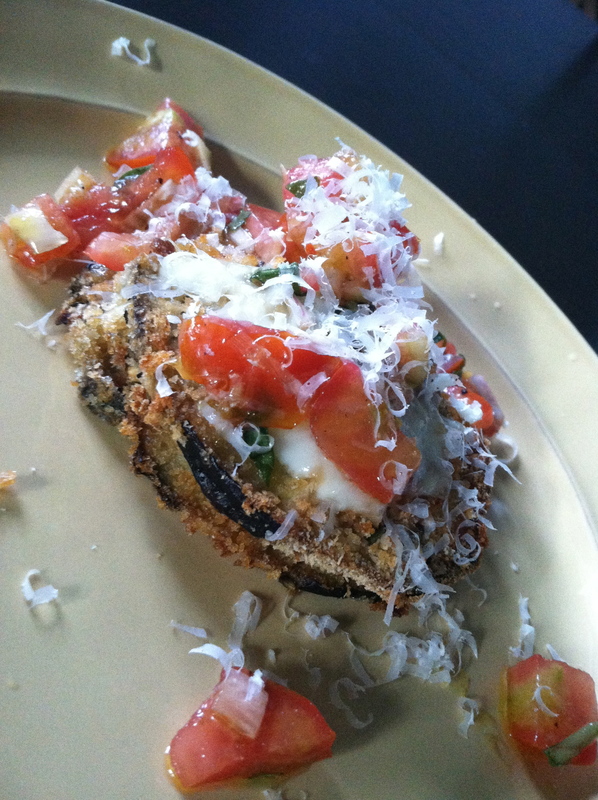 Place an eggplant slice on a baking sheet, top with a piece of mozzarella and basil, then another eggplant slice, a mozzarella and tomato slice, an eggplant slice. Repeat with the remaining pieces of eggplant. Bake in the oven at 375 degrees for approximately 15 minutes until the cheese has melted. Let cool for 5-10 minutes. < Previous Non-Stick Honey – Yes It Exists!